LT Photography is Responsive Photography Joomla template. 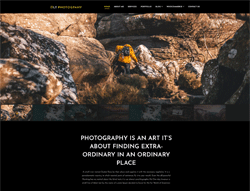 This great template uses for image gallery or photography websites to bring together photographers and those who enjoy beautiful and quality photographs together. Moreover, it shares content that is interesting and inspiring to photographers and those who enjoy photography. It builds for Photography Joomla template area with 100% responsive layout (support for mobile devices). LT Photography supports 4 color styles and working with strong framework, powerful shortcodes, unlimited module positions and easy to drag-drop layout content.